I was beyond excited when Bendel’s let me come play in their sparkly NYC store! Talk about a kid in a candy shop! From sequined jewels to python clutches to bright silky scarves, my head was spinning! I managed to narrow down my selection of goodies to a practical purchase, but I am definitely going back to do some more damage very soon!! What can I say? I’m a girly-girly who loves to shop!! 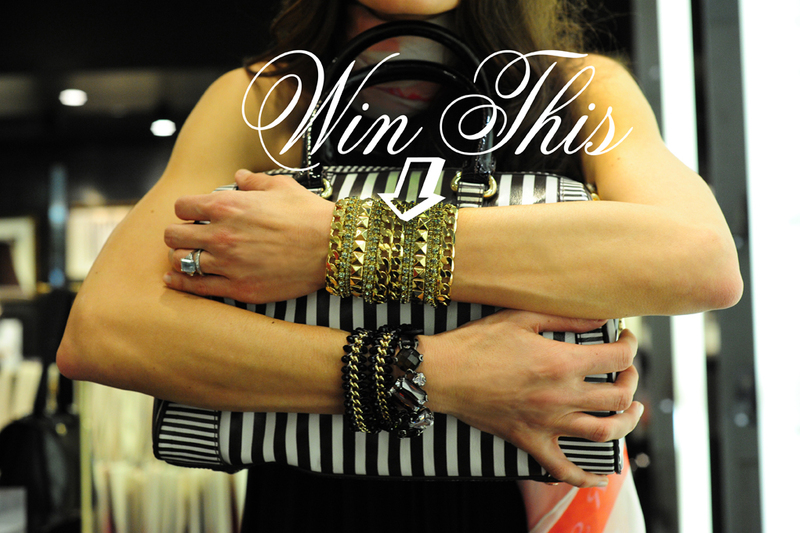 I’d love to share some of the bling with you, so I am giving away one of the rock-star cuffs! Just follow the deets below! 1. Leave a comment on this post so I know who you are!! 2. Follow me on Twitter & Subscribe to follow my blog (if you haven’t already). 3. “Like” my NYCPretty Facebook page. One lucky winner will be chosen at random later tonight! These pics look great! So mod. Kinda reminds me of Mary Tyler Moore opening credits. All you need to do is throw you hat in air. I absolutely adore this gold cuff and would LOVE to own it!! Btw, i’m a newby admirer to your blog…absolutely love it! I have also complied to your request to enter! My email address is uniquefaces2003@yahoo.com thankyou! The winner of the ROCK-STAR cuff is ….. Olivia Straka! Enjoy the bling!!! Everyone else, thank you for all the great comments! Stay tuned for more fun giveaways tomorrow! I have a very similar dress that I also wear with tights!! So fun! I love the whole shoot! Once again, awesome! The outfits are amazing! Aww thx!! Your book is on the way!! xoxo NYCPRETTY! 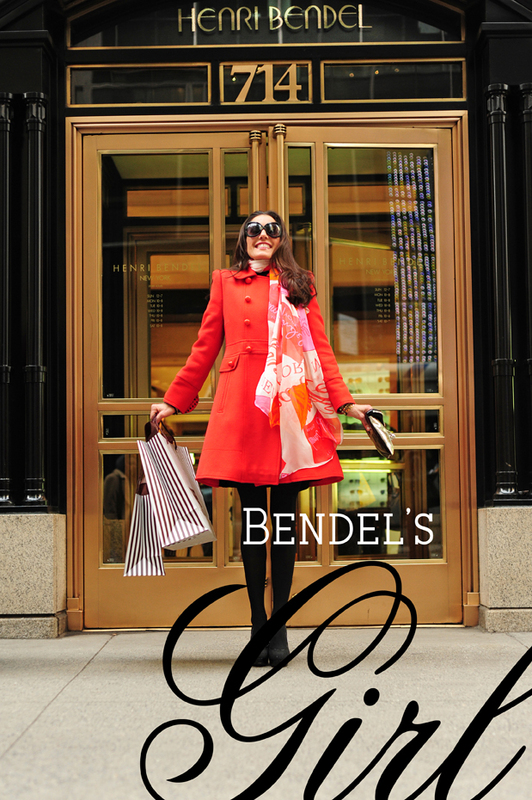 Have been a fan of Bendels since HS — back in the late 80s! Fan on Facebook now! Love the Bendel scarf and bracelet! This is one of my favorites so far! Love the whole look. Scarf, dress, coat and jewels! Following on Twitter and bloglovin’ 🙂 Fantastic blog, so glad I found it! SO GORGEOUS!! It would be such a compliment to any outfit!! I would LOVE to win this!! (: Thanks for the opportunity! Great Pics! I love love love Henri Bendel!!!! GORGEOUS! The hotelier in my loves the luggage rack shot! Love, love the bling & the bag!! So fun to punch up a black dress with accessories. Thanks!! Are you a new follower!!?? xoxo NYCPRETTY! You are the luck winner!!! Congrats Olivia! We will be contacting you with more deets later!! xoxo NYCPRETTY! Already followed you on Twitter,facebook and your blog! I love them all! You have such a way with fashion, i love seeing how you pair bright colors and accessories… simply amazing! I’d love a chance at winning this beautiful cuff! Next > WORKOUT WEDNESDAY Color Kick!